Do you ever get the feeling that a new song you're listening to sounds so great that it must be a cover of some old hit single, only to find out it's completely original? That's the feeling I got more than once when playing the debut EP from The Innocent, a.k.a Chicago singer-songwriter Michael Hardey. In other words, Hardey and his band have a very good thing going on that you should know about. Don't be fooled by the disc's noirish cover art. The Innocent play a very accessible blend of folk rock, pop and college rock that wouldn't feel out of place on a mix CD that includes the likes of Paul Westerberg, The Wallflowers, R.E.M. and Michael Penn. The two strongest tracks - "Beautiful Lie" and "The West Coast" - kick off the disc. If you're a fan of melodic, intelligent pop with choruses that ingrain themselves into your mind after a single listen, you won't find much these days that's better than this. The quieter moments, such as "Don't You" and "Tied Down," are less immediate, but still well-written, well-played tracks that warrant repeat listens. Add excellent production to all of this and you have a rock solid debut from an artist who, with any luck, we'll soon hear much more from. 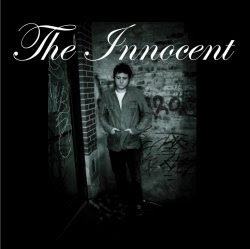 Check out The Innocent live on November 21 at The Underground Lounge and December 3 at Double Door. I've seen these guys many times and can say with full confidence that the band gets tighter and more rocktastic with each show. Definitely worth checking out.